MOPAC is excited to announce that we have recently unveiled a small tank solution to add to our customized solutions plan. For over fifty years MOPAC has provided drums and tanks for our customer for their outdoor used cooking oil problems, but we’ve decided to try something new. We hear our customers when they present us with feedback and problems. Over the years, our restaurants have reported back to us any trouble that they’ve had with their drums. 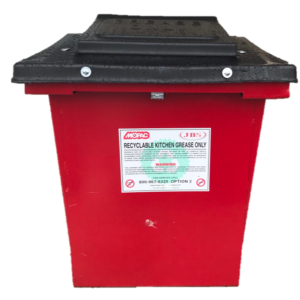 There are some common problems that frequently occur with a 55 gallon outdoor drum that we constantly work with our customers to overcome. Below are some reoccurring problems we hear from customers about their drums. We work with each of our drum customers to find the best solutions for them– suited to their location, their UCO needs, and their budget. Our restaurant customers want to lower their cost but don’t want to compromise of their storefront appearance. Splurging on an inside tank is a big undertaking and can be cost prohibitive. MOPAC has a variety of larger outdoor tanks available, but most restaurants don’t want a large piece of equipment blocking out the storefront’s impression.Working tirelessly, MOPAC found the Small Tank solution. Perfect for the small restaurant that is currently using drums to collect their fryer oil, our new small tank allows for the convenience of a much larger container but it’s size is equivalent to two 55 gallon drums. These tanks are constructed similar to our industrial large tanks, but paired down for size. It’s constructed using a 12 gauge steel for years of dependable service. Our lids are bolted down on all four sides, and it comes with a lock fitted underneath to protect your used cooking oil from thieves. The top lid is hinged and contains a mesh screen that keeps out any insoluble matter. MOPAC recommends these customized small tanks particularly for restaurants who have problems with thieves or tampering and for customers in high traffic or wooded areas where drums are likely to be overturned (surprisingly enough bears have been a problem for some customers in the Pocono areas). If your restaurant is interested in a customized solution from MOPAC find out more about used cooking oil collection or leave your information below to be contacted directly with our team. We also have other tank sizes as well as some basic housekeeping tips for our UCO containers (contact customer service for a laminated copy to hang by our containers).